Applications for the Numatic RucSac vacuum continue to grow each year. The 36V cordless vacuum innovation presents performance, simplicity, convenience and freedom of mobility at all times in all locations anywhere. The cleaning equipment’s major advantage is that it has no cable, allowing it to be used in numerous difficult situations. 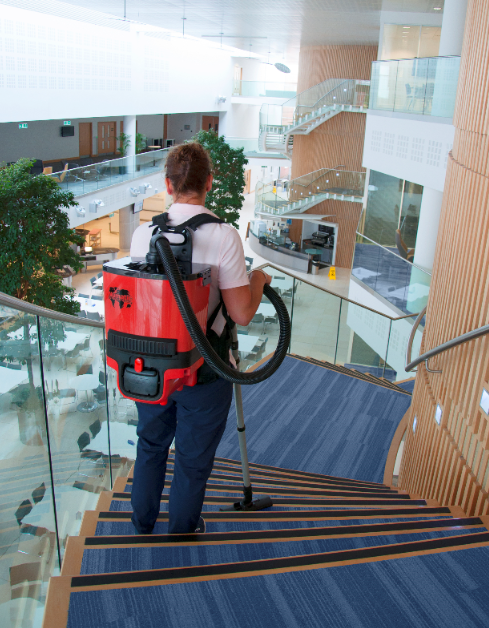 The portable vacuum has shown exceptional results and its rise in popularity can be attributed to its ability to be strapped on a technician’s back when climbing ladders, stairways and when working in congested areas and busy pedestrian zones. It can also be used to clean aircraft, busses and even cinemas. The machine has an integrated hand control module that is incorporated to allow both instant on/off operation to save power, as well as a battery condition monitor so that the battery reserve can be observed. There are many difficult circumstances when cordless professional cleaning is the most simple solution. To minimise any conflict regarding public and concerns in complying with increasing issues of Health and Safety, invest in this high powered cleaner. For more information, contact Numatic on 0861 686 284 or via www.numatic.co.za.